So my donation to the Twitter Art Exhibit 2017 being held in Stratford upon Avon UK is safely in the hands of the exhibition curators! This is Cool Llama In Purples. Measuring in at just a smidgen over 6 inches by 4 inches, this mixed media postcard sized art was created using colored pencils, ink and a tiny bit of acrylic paint on the red sunglasses. This whimsical llama art in purples, blue, yellows and greens was based on my original Cool Llama design created last year for a funny tee shirt competition held by Redbubble.com. Cool Llama can be viewed and purchased in my Redbubble shop. This is my fifth year participating in the Twitter Art Exhibit. I thought it was my sixth donation because I was convinced I had participated in the 2011 exhibit held in Moss, Norway. I forgive myself for that since my first participation was actually in 2012 BUT I created that postcard in late 2011 so, I got mixed up on the years! Founded by fellow artist David Sandum in 2010, the annual Twitter Art Exhibit raises funds for a different charity each year. The first show was held in the Moss Public Library in Norway and featured 260 artists from 24 countries to raise funds for new books for the children of Moss. The event has gone global, with art exhibitions from Miami, FL to Los Angeles, CA then back to Moss, Norway and then New York, NY in 2016. This years event in the United Kingdom has just closed it’s call to artists with over 1,600 artists participating from 65 countries! The charity this year is Molly Olly’s Wishes and the exhibition will run from April 1 to 19, 2017. Online sales will also be offered, so if Cool Lllama In Purples does not sell at the event, you may have a chance to purchase him even if you are no where near the UK. Plans are already in the works for 2018 and the location will be announced on opening night. We already have a tease that it will not be held in Europe or America. Mystery! As an artist, I feel very blessed to have the opportunity to donate to the Twitter Art Exhibit every year and while I don’t travel much, my art goes around the world. 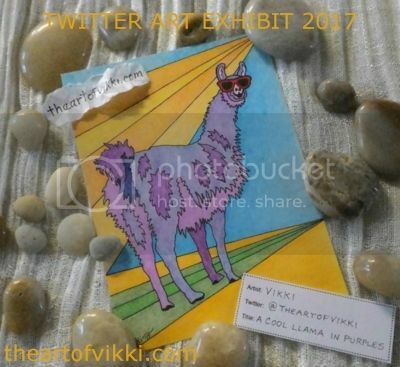 This entry was posted in Art and tagged #twitterartexhibit, art, Art exhibition, art for charity, art for sale, artists, artists for good, cool llama, cool llama in purples, David Sandum, llama in sunglasses, miniature art, mixed media, postcard art, tae17, theartofvikki, Twitter Art Exhibit, twitter art exhibit 2017 by The Art Of Vikki. Bookmark the permalink.